Happy Îd ul-Fitri, Happy Îd al-Mubarak, dear friends and all, to end the one-month fasting, with any enjoying activities to celebrate your happiness, dear friends .. such as visiting your parents and other members of larger families, like what does robusta coffee farmer family from Medalsari village, Pangkalan sub-district in Karawang district of W. Java, Indonesia, on the northern slope of Mount Sanggabuana. 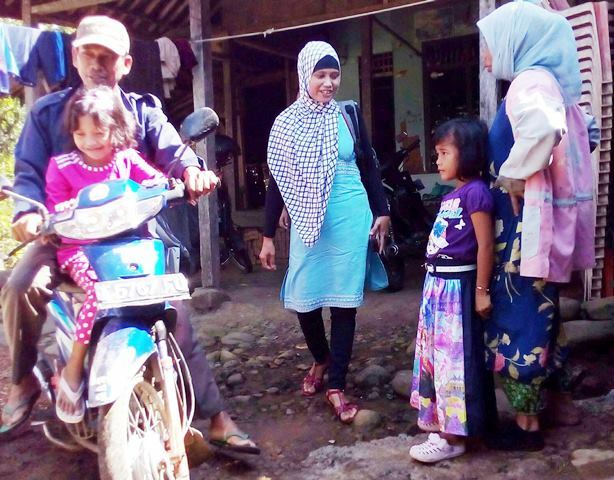 On Monday Mrs Adang (with checkered headscarf in the above image), along with her two kids were saying good bye before leaving to visit her parent to the neighbouring district. Pak Adang however could not join the visit that may take a couple of days or more, because none tend their livestocks. He keeps working, the least, during these holidays, just to secure while feeding them with looking for forage in the surrounding border of the forest ..
You can see him on motobike in the picture, while his daughter already sitting in front of him, waiting for his wife as she greeted a relative before leaving. Another male relative who helped to take his son (not seen) as he drove them to nearest public transport stopping place at Cariu sub-district in Bogor, about 12 kilometer away from their hamlet of Tegaldeeng. 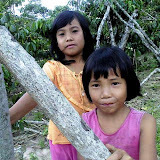 “We arrive at the destination only before nightfall,” Ms. Adang told me informing the long trip to her parent’s village of Leuwiliang in westernmost of Bogor district as they departed a quite while before noon. There is yet direct transport means in many remote areas in the country! They had to take several changing public transport means .. These holidays also particularly mark quite a pause from coffee harvesting activities, particularly for those farmers who really want to improve the quality of coffee beans, as we have been proposing them with a fresh post-harvest framework, independently. 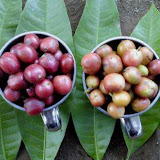 Farmers ever since joining the wagon to pick coffee cherries carelessly have no more the urge for post-holiday coffee harvest as there is no even remaining cherries.